As you all know, I'm in love with dressing for the occasion - whether it's a carnival, a beach day, a day at the zoo.. you guys know me, if it's something I can dress for, you know I'm there! And a road trip is the perfect time to bring out some really adorable style. I adore this Poconos Jumper and these Ruby Toesday flats! I have this Seeing Red Dress, but in black, but I like it so much that I'm contemplating even getting it in red! 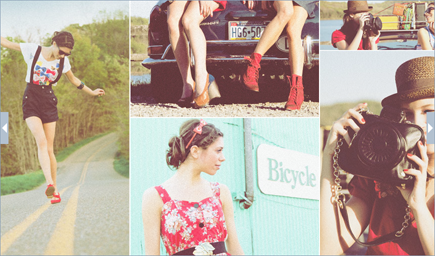 Red is such a perfect picnic dress, road trip dress, whatever. I've had a slight obsession with red lately. I've seen so many bloggers in love with this Shutter Speed bag - with good reason! Gimme this entire outfit here, please! Ah! The Betsey Johnson socks are so cute! I'm really excited that mixing prints is still in style because it's something I have so much fun doing with my own personal style. 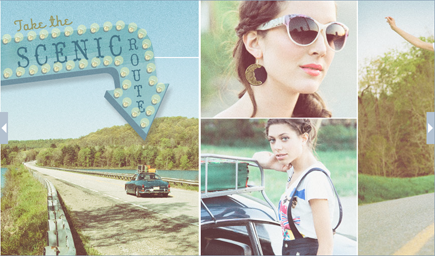 If you guys haven't checked out ModCloth's Summer Road Trip collection, you must! You'll be drawn in with dreamy photos and inspiration to carry you through all of your summer road trips, which Brett and I have many, many planned coming up really soon! Have a wonderful weekend everyone!